Ah, everyone’s type of Tampa Bay Rowdies match. When the Rowdies make one or two defensive mistakes all night that the opposition pounces on, create the bulk of scoring chances but only convert one and settle for a point. The Rowdies remain unbeaten under Neill Collins after a 1-1 draw with Nashville SC, but we’d rather not make a habit of these draws at Al Lang (3 straight). Hopefully after a much-needed week off the Rowdies will finally start turning these close results into wins. Seen some saying that Alex Morrell was to blame on Nashville’s goal and that was why Neill Collins pulled the trigger at halftime and swapped Morrell for Leo Fernandes. Can’t get on board with that take. Yeah, Morrell was the last to touch the ball before Nashville launched its counter attack, but he was trying to control a pretty poor pass out of the back from Tamika Mkandawire. As solid as Tam has been in his three appearances since the coaching switch, he had a bad moment here. His pass put Morrell in a tough spot, he doubled down on that mistake with a bad decision by running toward the ball as Nashville charged down the center of the field, leaving the eventual scorer wide open of the left side of the box. After this sequence, Tam was terrific the rest of the night. Not sure anyone had Leon Taylor coming in to score such a crucial goal in his debut, but we’ll take ’em where we get ’em these. Kudos to Taylor doing what many has struggled to in recent weeks, taking a quick strike with confidence rather than waiting an extra beat for the perfect opening. More of that and he’ll be in line for more meaningful minutes. Taylor had some really positive things to say about Collins after the match, maybe showing one of the still fresh coach’s strengths. I was sure Matty Pickens wasn’t going to get a WHO ARE YA from the Mob yesterday, thought he might get the silent treatment as other returning players have, but the chants and cheers were the perfect way to welcome back a guy who meant so much to the club and fans over the years. Post-game, Neill Collins gave credit to the players for their hard work and effort but followed it up with “the time for celebrating that is going to quickly come to an end.” They rallied for a point last night but slipped a spot in the overall standings and now sit just outside of the postseason picture. It’s time to start turning these draws into wins if we’re going to get where we feel we should be. Rowdies looked the more dangerous team for most of that first half. If this is Neill’s style and system, goals and points will eventually start rolling in, especially as players return from injury and suspension. Most teams don’t have a keeper like Pickens, as we all know from his time here. So I think it’s safe to say, against a lesser keeper, we’d likely have won that game. Pickens was a super player for the club and I’m happy the Mob gave him such a warm reception, but I would have preferred he not have such a great game! Credit to Nashville, they put in one hell of a defensive battle. The Rowdies looked to be beginning to implement a style of play, and doing so with energy and pace. They created the chances, and had opportunities to take all three points, but didn’t put them away. It’ll be interesting to see what happens when Neill decides it’s time to stop praising effort and demand execution. After months and months of wondering what’s next for the Rowdies with the MLS bid stalling, we may finally getting a sense of where Bill Edwards wants to take the club from a lengthy interview with the Business Observer posted on Friday. In the wake of Cincinnati and Nashville being tapped by MLS for expansion, Edwards is still holding fast to his claim that he’s searching for investors to finalize a bid that will win MLS over. That’s the same line Edwards has been selling for a year and a half, so I’ll believe it when I see some actual names attached. What catches my eye, though, is the indication that Edwards is considering moving ahead with his plan to increase the capacity at Al Lang even if the Rowdies stay in the United Soccer League. Edwards is not directly quoted on this, but it would be a huge development, if true. I had to read that section twice to make sure it was real. Sure, MLS might be nice. It certainly would be the easiest path to unlocking the potential of Tampa Bay as a soccer market. However, that shiny, new addition to Al Lang has always been the most appealing part of the expansion bid to me. Say what you want about Bill Edwards (and you could say a lot), but he’s given the club and its supporters a true home at Al Lang. I’m greedy, though. I want that outfield wall to come down and to see Al Lang fully transition into a soccer facility.There weren’t many folks knocking on city hall’s door looking to not only use Al Lang, but invest in it. 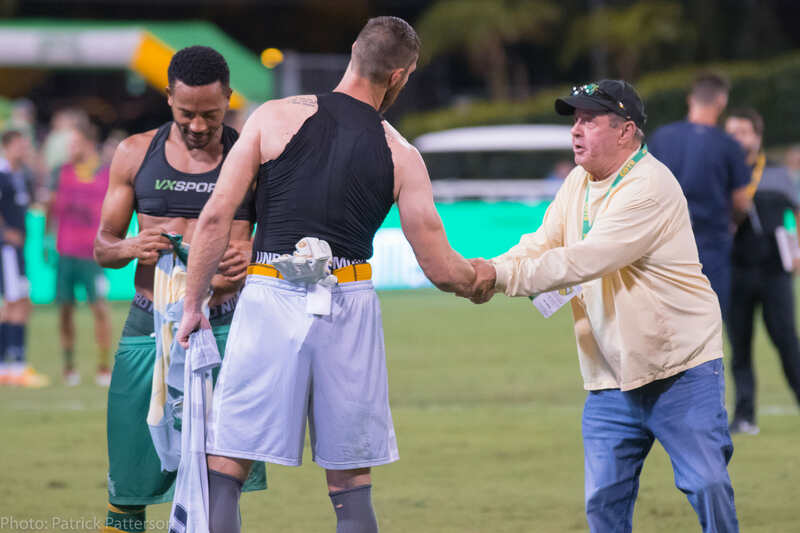 With the private money Edwards has pumped into the city-owned venue and the steady growth in attendance the team have seen since he took over, the Rowdies have more than proven their worth to downtown St. Petersburg. Why not keep building on that? Many were concerned Edwards would lose interest and sell off the Rowdies when MLS passed (He still may sell the team to a group that plans on operating the team in the USL. There’s too much smoke to that particular rumor for it to be totally baseless. We’ll tackle that if/when we have to.). Losing out on MLS is no reason to throw in the towel. Look at Louisville City, as I’m sure Edwards has. That club has achieved a tremendous amount of success, including public funding to build its own stadium, without selling any fan or public official on the promise of MLS. Edwards claimed he could get his stadium plan done with $80 million of private capital (Probably a generously low number, but we’ll go with it.) That’s the price tag if he wanted to expand up to MLS’ capacity standards of 18-20k. Who says the Rowdies have to do that? A more modest proposal to add only 6-7k seats can be done at a lower cost and would still essentially double Al Lang’s current capacity. That type of scaled down expansion would make Edwards or any future investors a little more comfortable if MLS revenue is definitely out of the picture. I don’t make it to many matches at Al Lang, but I was there last week. I was also at one of the first matches they played there. What they’ve accomplished since 2012 is remarkable and should not be dismissed. It’s hard to go to S.t Petersburg on a Rowdies gameday now and not feel as if this team matters to the community and those businesses downtown. The Rowdies didn’t build all that goodwill based on the notion that they would be in MLS someday. Edwards only made that ambition public at the end of 2016. It’s been the investment in Al Lang and in the community, a commitment on the local level to embrace St. Petersburg, and Edwards putting his money where his mouth is year after year that has this club poised for further growth. The Rowdies don’t need MLS. They need a plan for the future and someone willing to act on it.